With the advent of newer and newer technology in mobile phones, the society has become highly dependent on mobile phone these days. Almost every where people can be seen indulged in their phones, texting, tweeting, surfing or playing games. People can be seen using phones in social gathering and completely ignoring the conversation or an event going on. Even in offices especially during meetings one can see professionals fidgeting with their phone, this impacts not only the work flow but also leaves a negative impression on others. Handling mobile phones in social places and in offices have become a major concern these days. It is important to understand the appropriate time and way to use mobile phones not only in public places but also when alone. So having proper telephone etiquette is very important. 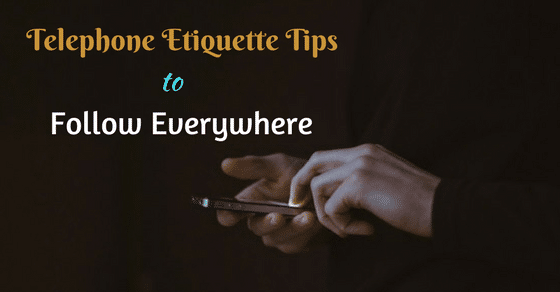 What is Proper Phone Etiquette to Follow at Home, Office and Business? If the number showing in the call is unknown then it is best to mention the name while picking up the call, greet the caller and mention your name. It leaves a good impression to the caller also, saves a lot of time from the introductory conversation. While talking on the phone, pay attention to the volume of your voice. Since one need to understand, it creates distraction in the surrounding area also it hurts the listener’s ears too. If in case one is in the crowded place and has to talk loudly to make the other person listen, it is better to message the person and call later rather than talking loudly. Whenever in a crowded place or in a meeting it is important to know if the call is urgent or not, sometimes it is good to send a message for call back rather than picking up the call. Disturbing the meeting in between leaves a bad impression among the seniors and peers, also when in social gathering it disrupts the atmosphere around when a phone buzz in. When in an official meeting or even meeting a friend it is good to not keep the phone on the table as it leaves an impression of not paying attention to the conversation going. Also there is always a temptation to pick up a phone even during a conversation. It is good to pay attention to the conversation going and leave a good impression on the others. It is advisable to keep a subtle ringtone rather than any rock inspired ringtone, which can be a source of distraction in office or in a public place. It is best to keep the phone on vibration mode when in meeting or in public space. It is important to note the reason for leaving a voice mail. Keep it short, simple, to the point and quick. It saves time for the listener to get the message and respond to it. If leaving the contact number is required, then say the number slowly and clearly so that the person can understand it in a time. Long irrelevant voice mails can be irritating to the listener. While talking on phone it is good to be polite and use correct language. Words leaves impression for long time, improper words can leave a wrong image of you on the person while good words used will make them remember you for a long time. Also, if someone else comes across your conversation they should be able to appreciate your words. Even talking to someone on phone it is good to pay attention to the person and not to miss the conversation. The person on phone might not be able to see you, but can sense when you are missing out on the conversation. Also, don’t forget to make the appropriate comment while talking as it makes the other person assured of your engagement in the conversation. Sometimes when a person is at home, they might be engaged in other household work and tend to miss on the important calls. It is good to keep the phone nearby in your vicinity of work so as to attend the call, also to increase the volume of the ringtone so as to know when the call might be there. It is a general habit of people to multi task while on phone. But it is advisable to avoid doing it, many people have the habit of cooking, washing dishes or watching TV while on phone. But due to the diverted mindset, other problems can arise, the sound of cooking and cleaning or the can be heard to the other person, who might feel as if you are not paying attention to the person. These days mobile phones have become another world altogether, with various apps, music, games, camera. If the person is not talking on phone then people tend to fidget on the phone by playing games of clicking pictures unnecessarily. It is advised to know and understand if this behaviour is required. Often it does not look good and others might not take you seriously. Never eat or chew while talking on phone, the other person can easily make out if you are eating or chewing while talking. It is a rude gesture when one is doing it, also the clarity of the voice reduces while chewing and conversing on phone, making it difficult for listener to understand the conversation. At times, people tend to put the person on hold without informing it. It is extremely rude gesture while in middle of the conversation, and suddenly putting the person on hold. If in case it is required, then the best thing is to take permission from the person to put on hold or at least inform them. Also ensure not to put someone on hold for longer period of time, it is better to apologise and ask to call them back. Many a times it happens that people tend to leave their phone with you in case for emergency while they might be attending the meeting. It is important to note that one should not sneak into others mobile. It is not appreciable to break someone’s trust even if we think that the person might not be able to figure it out. Even if it’s your spouse or a close friend, then also avoid peeking into their phones. Lot of people don’t have the habit of replying to the texts, one should ensure to reply to the messages immediately. It shows the amount of sincerity one shows towards the person. Even if the message is from the boss, friend or family member, it is essential etiquettes of replying back to the messages. Many people have the tendency to message while using capital letters, it is to be avoided completely. Since it signifies as if someone is shouting or talking loudly through messages. Use capital letters as in when required, and using small letters is the sign of healthy messaging conversation. One might not feel these to be etiquettes for immediate benefits, but it surely will develop healthy habits and also create a positive image of the person among the people. Using phone should not be considered as a different form of communication, as its importance is equivalent to the face to face conversations that are made. Next articleJob Networking – How Networking helps to Find Employment?